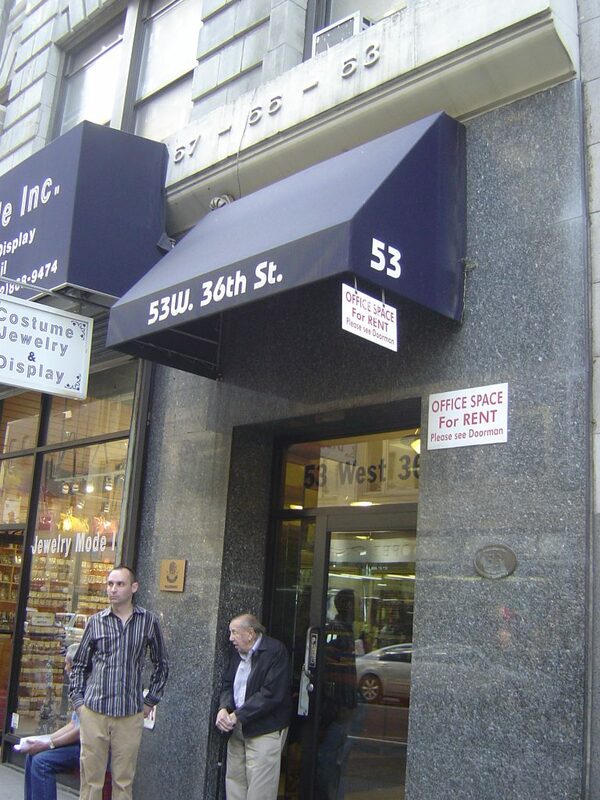 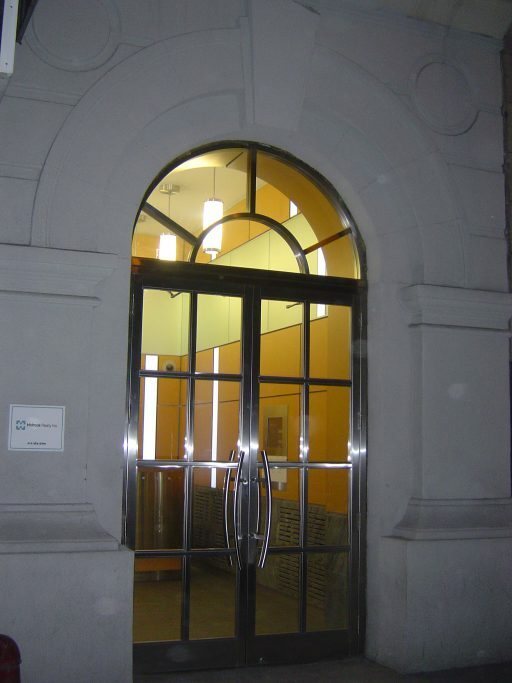 This Midtown Manhattan office building in Herald Square required a major lobby renovation, and total redesign of the entrance way. 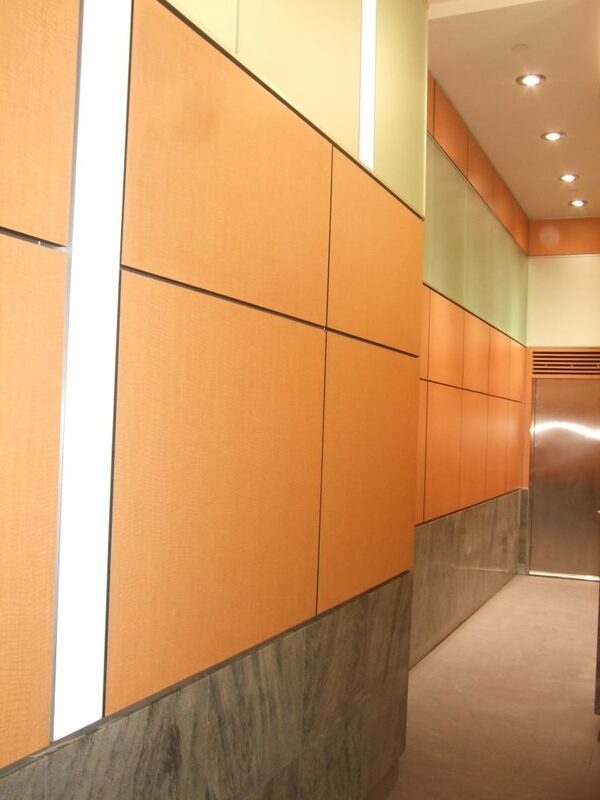 4SDI implemented the entire construction renovation and project management, including production of all the custom millwork, stainless steel channeling, glazing, stone tiling, electrical, lighting, security system, lobby entrance way door, and exterior masonry. 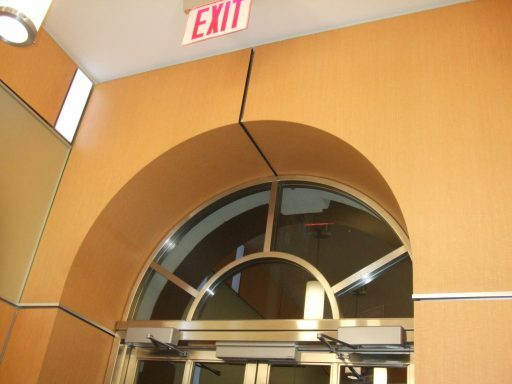 Over 68 custom 3/4″ wood veneer panels were milled offsite, including a two-piece custom cherry miter cut curved archway above the upper interior of the lobby entrance way. 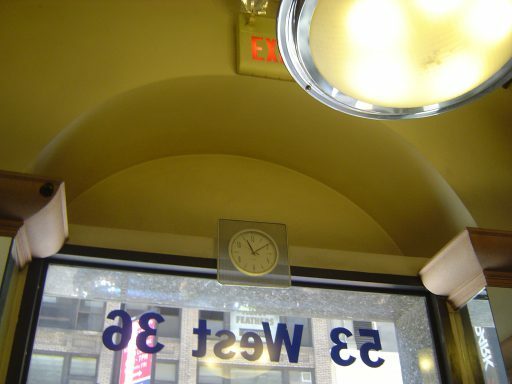 Twenty-one LED light boxes of various sizes had to be specially-made and installed to fit between the custom panels and glazing. 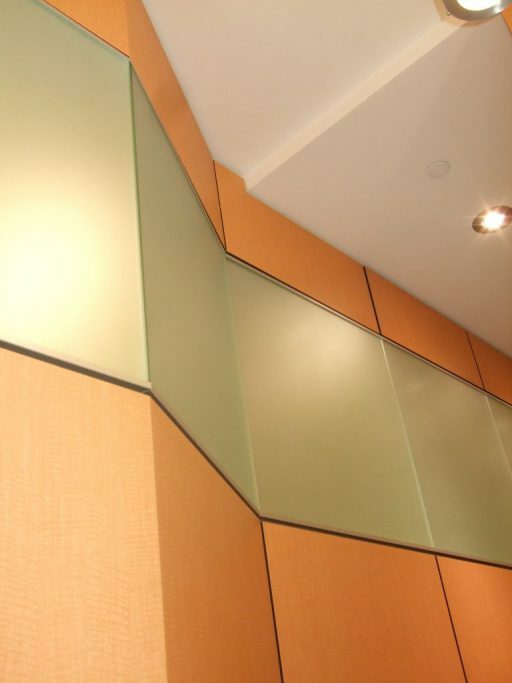 Forty-two frosted glass panes had to be produced and installed above the custom paneling. 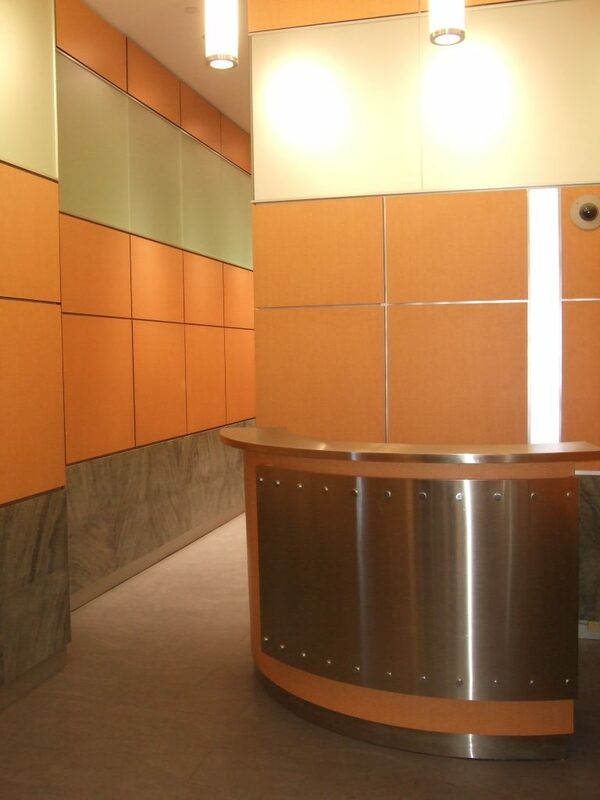 Grey stone tiling was installed as lobby flooring and wainscoting. 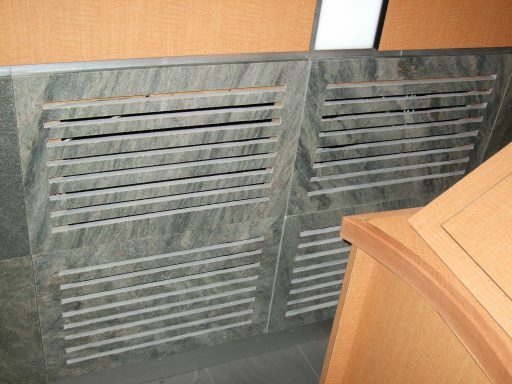 A custom cherry air vent cover and eight removable stone radiator covers were produced offsite and installed. 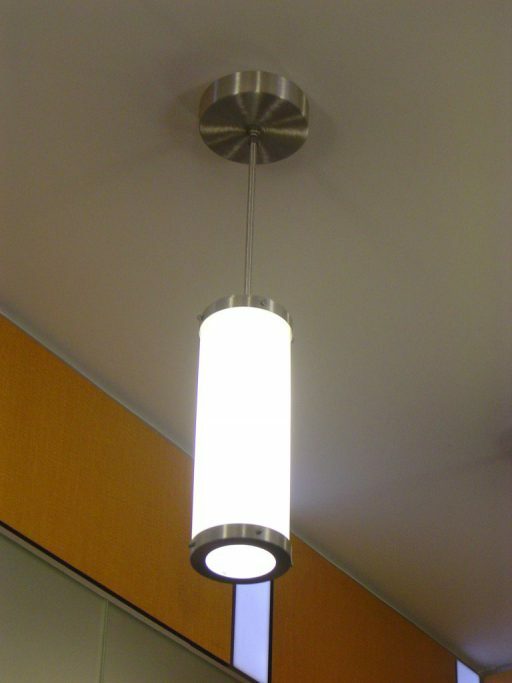 Recessed lighting and 8 beautiful brushed chrome cylinder hanging pendants were custom ordered and installed in the drop ceilings. 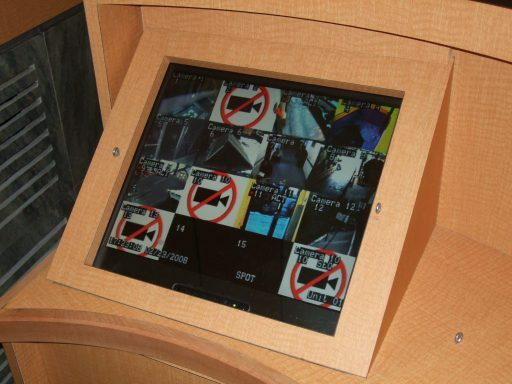 The operation of the complete lighting system including the lightboxes are all remotely controlled by a timer. 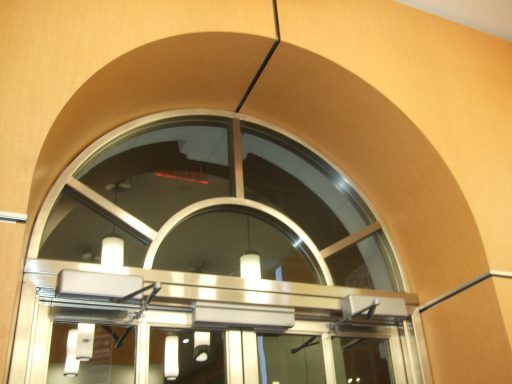 Prior to doing all the finishing work, a new complete sprinkler system, a new sound system, and new security cameras were added and installed. 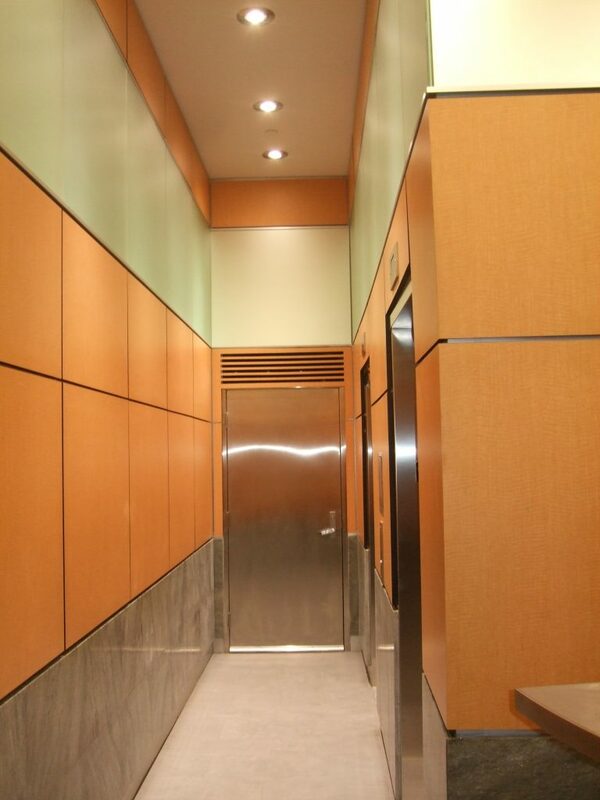 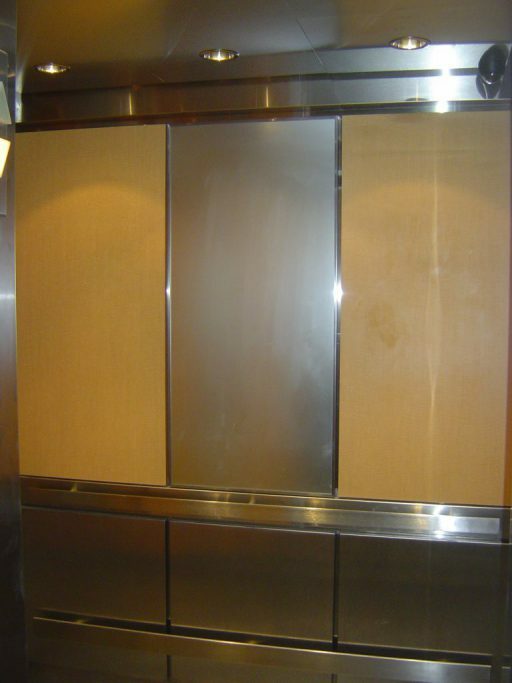 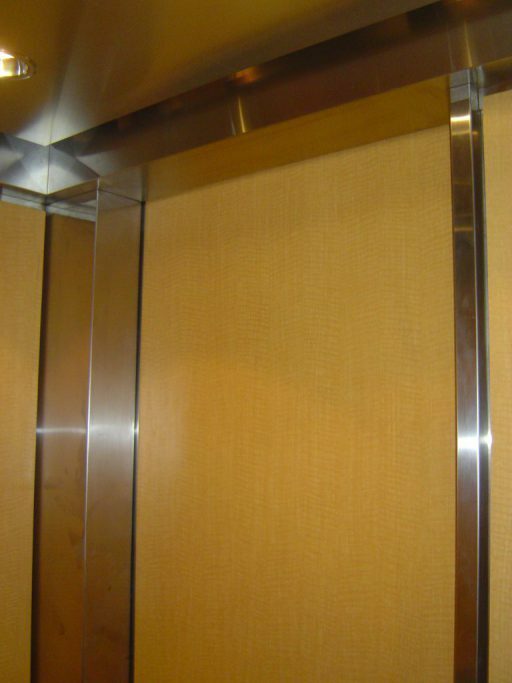 To add a wonderful finishing touch, brushed stainless steel elevator panels were installed inside the lobby elevators. 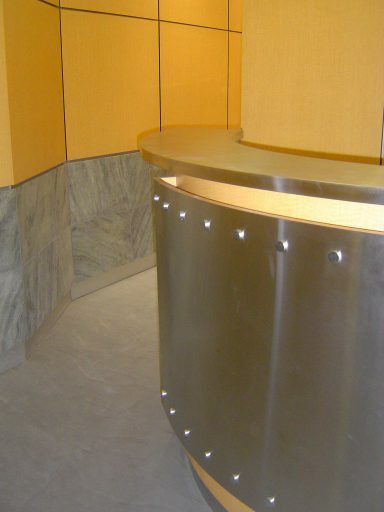 A curved custom cherry and stainless steel reception desk with front recessed LED cove lighting was handcrafted and became the crown jewel of the lobby. 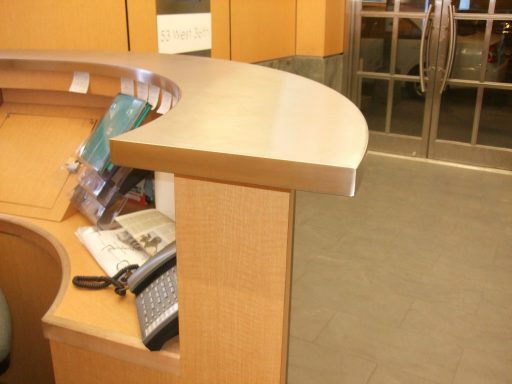 The desk was built offsite to accommodate a security monitor system. 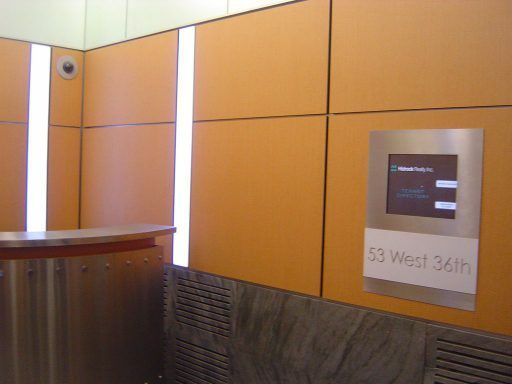 A touch screen digital directory was installed and programmed and custom fit inside the millwork. 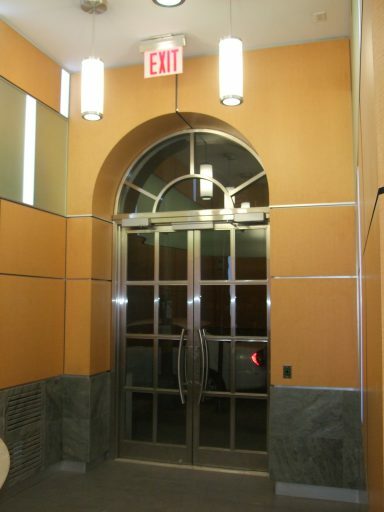 The major focal point of the project was a 12′ custom glass and brushed stainless steel entrance way door with archway transom to the lobby. 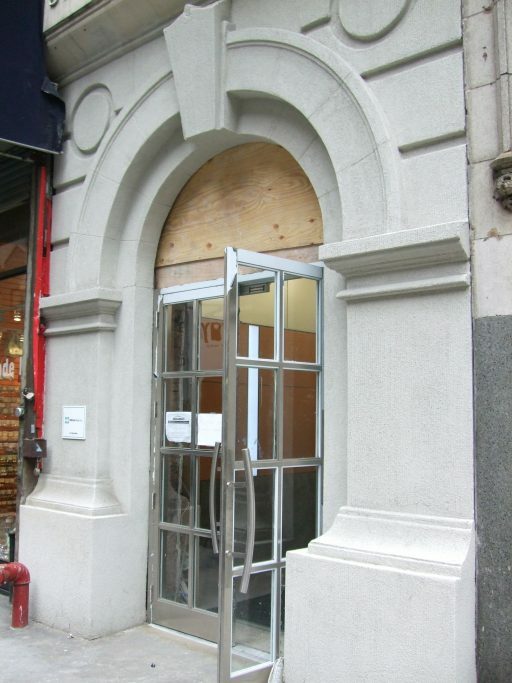 This was framed by a special exterior stone archway with keystone, which our stone mason created onsite. 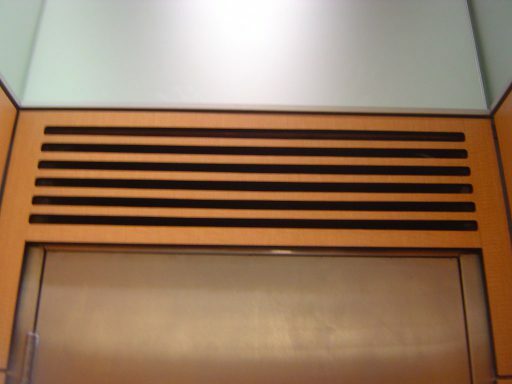 Note the radical change before and after, a transformation from old and shoddy to a lobby of exquisite modern beauty and sophistication.